What an intriguing pattern. Suitable for cycling and for evening wear. Essentially just a princess seamed dress with 8 panels I think, and a short bolero jacket. While it is pretty and the full skirt would make it easy to cycle in my experience is that wide skirts are not the most suitable for cycling. It would blow up and could get caught in the mechanism. And the hat and jacket are elegant rather than ideal for cycling. She does seem to be wearing a sports or walking shoe. What do you think? 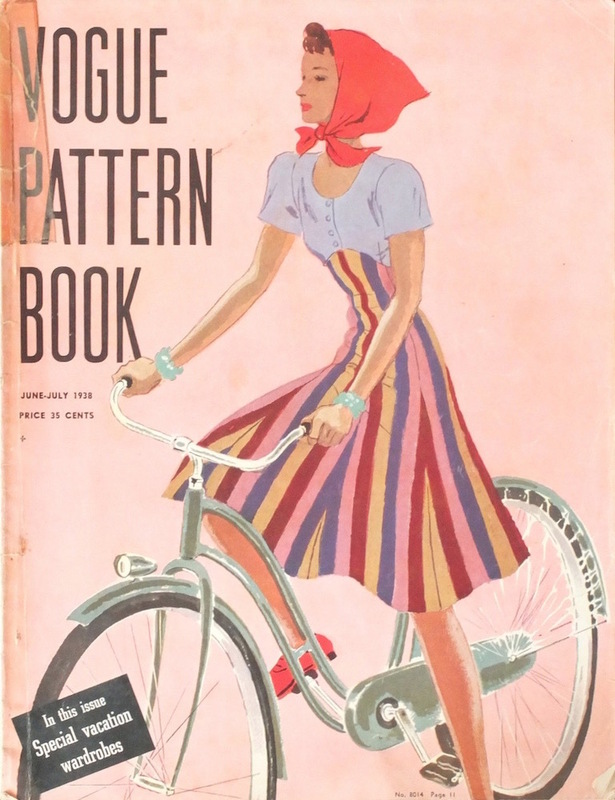 I feel like the cover illustration shows a wider skirt than the pattern envelope. I suppose the only way to know would be to make it up! It’s interesting that Vogue was serious enough about the cycling aspect that they made a point of showing bicycle handlebars on the envelope..
That’s a lovely illustration- and a very stylish cycling outfit!